I've been blogging here at Estella's Revenge for 8 years, and spent the year prior to that at a now-defunct blog called The Wasteland. I started blogging just as I started graduate school, which means there was a lot more cursing back then. Now I blog about books and whatever else moves me. That often includes gardening, food, home decor, my awesome child, and whatever else seems bloggable! In my everyday life, I'm the Director of Public Relations for a university in north Texas. I also teach online classes; I've spent the last nine years teaching English in higher education. I have an adorable 3-year-old named Greyson and am engaged to an adorable 33-year-old named David. 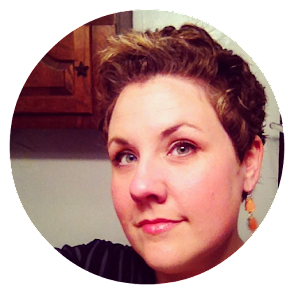 And I should also mention that I'm profiled over at Book Bloggers International today! A happy accident indeed. I've read some great books this year that I've really, really enjoyed. That's one of the upsides of a "free range reading" attitude. I read whatever strikes my fancy and generally ditch anything that isn't enjoyable. Definitely this one. A reflection on how becoming a mother changed my reading perspective. One night last week, my son and I were sitting out on the deck as it was getting dark outside. We usually don't hang outside that late in the evening, but he suddenly wanted to go outside, so I didn't protest. He was casually playing with sticks, and I saw a dead bird fall out of a tree, into the yard, in my peripheral vision. Needless to say, we went back inside. Ugh! Meeting new virtual friends! I've made some very real and lasting friendships through this community. Most notably, my Matron of Honor in my wedding is Heather! My bestest friend who I met online and have been e-mailing for 12 years. It's also a pleasure to work on community-building projects in the blogosphere. Heather and I host Dewey's 24 Hour Read-a-Thon and we're the founders of The Estella Society. It's nice to meet anyone new who may be flowing through for Armchair BEA!!! Have a great week, y'all! If you're interested in what I've been reading lately, take a minute to watch this video blog (vlog) post! The Gene Yang book I couldn't remember is The Eternal Smile!!! So glad I just bought Eleanor & Park--seems everyone who reads it falls hard for it! You have a happy, wonderful week too!!! Awww, thank you, Debi! I do have plans to vlog far more often. Now that I've realized, DUH, I can do it easily on my iPhone. Why I didn't think of that before, I have no idea. Arrgh! I can't wait to hear what you think of Eleanor and Park! Hello there! It's been awhile. I've been MIA for awhile due to some stuff, but I have thought about you and the blog, and loved this post. I totally would have went inside after the dead bird too! Looking forward to seeing more reviews, and I'm glad Relish was so good. I have it and have been excited to read it. Ahoy there, matey! I love the vlog! LOL, thanks! I couldn't resist posting the pirate pic. Why, thank you! I usually just wind up hearing myself on video and thinking, "I can't really sound like that." OMG 8 years of blogging with so many things to do in life, congratulations! One of my dreams is to join a Read-a-thon, but I'm never available when it happens. though I have my own read-a-thons many a time. I also dream one day I will have time to do vlogs. thanks for encouraging me with your blogging examples! I hope you can join us for the Dewey's 24 Hour Read-a-Thon in October. October 12th to be exact! Nice to meet you! Hope you enjoy Armchair BEA! Thanks! It's nice to meet you as well. Eight years is a long time, you're an old hand! How nice that one of your blogging friends was an important part of your wedding. I've met several Dutch bloggers and we're friendly, but not friends. Judith, I am an old hand! I can't believe it's been so long. There are always ups and downs, but the good stuff and the community far outweigh any downsides. I hope you get hold of a copy of Me Before You! It was really lovely. Thanks so much, Monika! It's amazing how those little ones change so many things. I never would've guessed how dramatically those feelings about specific themes would change. Thank you, Amanda!!!! We TOTALLY need to be neighbors and share baked goods and homemade sweet potato and bean burritos (that's what I had for lunch today, from my freezer stash). On with the commune! "I started blogging just as I started graduate school, which means there was a lot more cursing back then." Haha! That's hilarious, and I can relate. I've been blogging for a long time, but I started a book blog, specifically, around the time I was headed to graduate school - so I definitely get it! I didn't realize you were an online instructor - I've been looking into that as a possibility while I'm completing my doctoral program. I teach at my University and as an adjunct at another private University, but I would prefer not to have to make that extra drive. And yes! I've been instructing online for over 5 years and I love it. I miss getting an on-ground "fix" though. It's great for time-saving once you have the courses set up and ready to run for a bit. You are all over the internet today! Woo hoo! I am ON IT, Rebecca! I love Armchair BEA! I loved Attachments by Rainbow Rowell. You should read that one! Loved hearing your voice, Andi! You should do audiobooks. Chris, I have a feeling she's gonna be one of those authors whose work I have to devour! All of it! Aren't they??? I love them for the most part, but when I accidentally assign due dates at the same time, I kick myself. Stagger! Stagger! Andi, you are so flippin' adorable and you must do more vlogs! 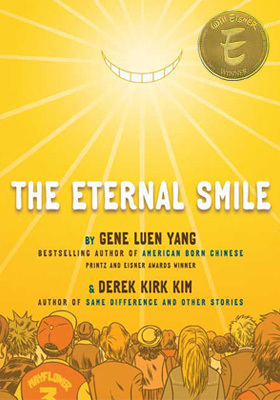 I'm reading American Born Chinese super soon for book club and I might cave early just because of how much you loved it! Enjoy Armchair BEA this year! Well thank you! And I will! I hope you love American Born Chinese as much as I do. I think you will. I am confident! You are a delightful vlogger, Andi! Ooh I've been hearing good things about "Me Before You" - I want to check it out! Thanks for stopping by my BEA post! Charlene, it is such a great book and I SO didn't expect it. The premise did nothing for me, but the book was great. I am so happy you did a video blog! Listening to your accent reminds me of home - I loved it. (I used to live in Oklahoma, not quite Texas, but the accents are similar) I read Moranthology last year and want to read How to be a Woman this year. Have fun with Armchair BEA! Awwww, yay for state neighbors! I love Oklahoma too and spent a lot of time there growing up. We vacationed at Robbers Cave in Wilburton every year. I also had relatives in Poteau. Thanks for stopping by and commenting! 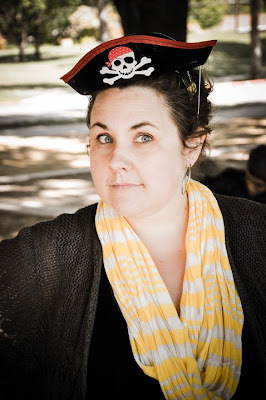 I love your pirate hat and your whimsical approach to your blog. As a new blogger, Dewey's was definitely a highlight of my blogging year so far. I can't even imagine how much work goes into doing that, but I'm totally game for helping out more in October. I really, really need to read How to Be a Woman! I loved her interview on Fresh Air. How to Be a Woman kept me company during a longgg day at the car dealership. Made the time fly, and made me LOL in public. Your pirate hat is awesome! My cousin loves all things pirate-related, and she'd definitely love one of those! I have Eleanor and Park out from the library at the moment, and I'm looking forward to reading it soon. Thanks, Lee! That was a shot from my 3-year-old's pirate birthday party! We had tons of fun and the coolest cake ever. That reminds me...I really need to post pics! I hope you love E+P as much as I did. It was just such a wonderful awesome fantastic book. I must have missed your other vlogs because I would have remembered your awesome accent! :) I'm not Armchairing this year but I still like reading the posts! Hi Estella! Thanks for visiting my intro post. :) You mentioned your ex is a designer. Designers are awesome to date, unless you're one too. I also dated one, and the disagreements we had over stuff was insane! Clash, clash, clash. I'm glad you love good typography. More people should. Life would be much easier. Congrats on your upcoming wedding! SO exciting! Hi, Jana! You're most welcome. And yes, I find that two designers together can be a hot mess! And OMG, 8 YEARS! That is huge! I love participating in Dewey's Read-a-Thon, thanks for being an awesome host! I keep forgetting about Me Before You and then seeing it listed as a favorite by somebody and remembering it again! I enjoyed your post and your motherhood/reading post too! Okay, I'm going to get to Boxers RIGHT THIS MINUTE. You convinced me. Do it! And don't be shy about Googling! That was fun! Loved your vlog or whatever you call the video thing (feeling old). Gene Luen Yang is awesome. I'll have to watch for his new release. And, Me Before You . . . oh, man. The tears. I will never forget how physically painful the end of that book was. I was mad and sad and at the same time I understood. It is so beautifully done. YES, you described the ending of Me Before You, so well! I knew it had to end the way it ended but my GOD, I was physically pained by it! Definitely watch for Yang's new release! And thank you re: vlog! I enjoy doing them, so maybe I'll do them more regularly. Ok, this tells me I've been way out of the loop because I don't remember seeing your other vlogs! So nice to "hear" you :) We need more vlogs from you! After this comment I'm going to my library website and checking to see if they've got Eleanor & Park! I noticed a slight southern accent. It's adorable!